Do you have one of those favorite shirts or t-shirts that just feels right next to your skin? Radiant Cotton is a yarn that gives me that sensation. It feels nice in the hank. It feels nice wound into a cake. It feels very nice going through my fingers to the needles. And it feels great in the knit fabric. Starting today, this week we’re going to feature Radiant Cotton and look at some lovely ideas for knitting up projects for warmer weather. 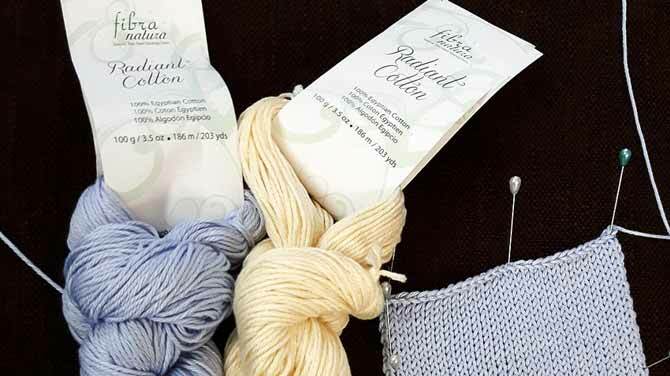 Fibra Natura makes Radiant Cotton and it’s distributed by Universal Yarns in the US and by H.A. Kidd in Canada. This cotton yarn is made 100% of cotton grown in Egypt and processed in Turkey. Egyptian cotton has developed quite a reputation in the hand-knitting world, but some of you may recall that it’s been in high demand for bedding and linens as well because of its superior characteristics. Egyptian cotton has a very long staple and its own natural sheen. It absorbs color extremely well compared to some other cottons. 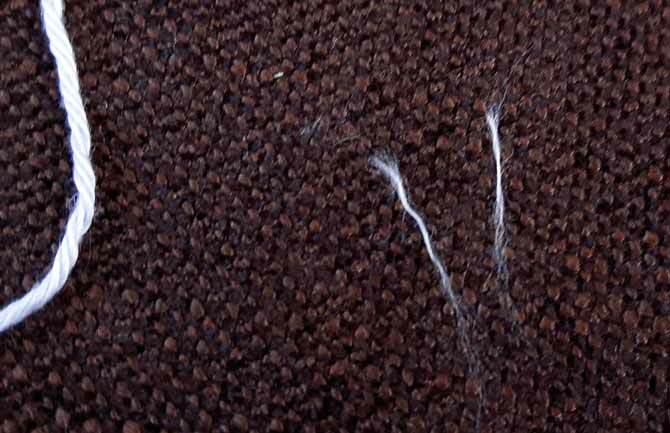 Another key aspect about the integrity of this cotton is that it is hand-picked rather than machine harvested, which keeps the fibers sturdy. This Egyptian cotton yarn is nice to the touch in the hank and in the swatch it has amazing drape, with a subtle sheen and great stitch definition. When spun for hand-knitting, Egyptian cotton keeps its famous softness and sheen at the same time. 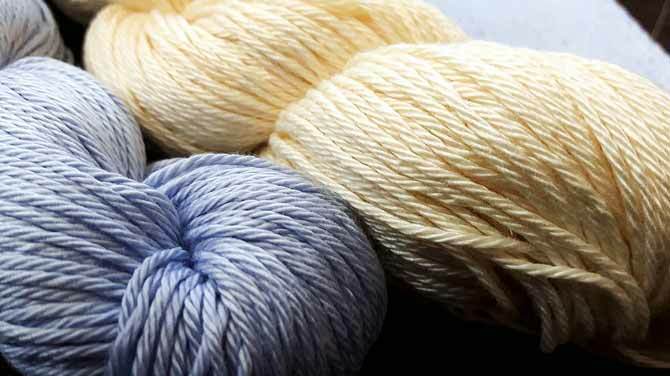 Four individually spun plies of the cotton fibers are spun together to make Radiant Cotton. Untwisted end of Radiant Cotton shows 4 individually spun plies that are twisted together to make this soft yarn. I tugged out the fibers and was able to get some tufts and individual strands that were between 1″ – 1½” [2.5 – 3cm] in length, but I was pulling from a cut end. If I were to untwist a single ply more gently rather than tug at it, I’m sure I would find individual fibers three times as long. 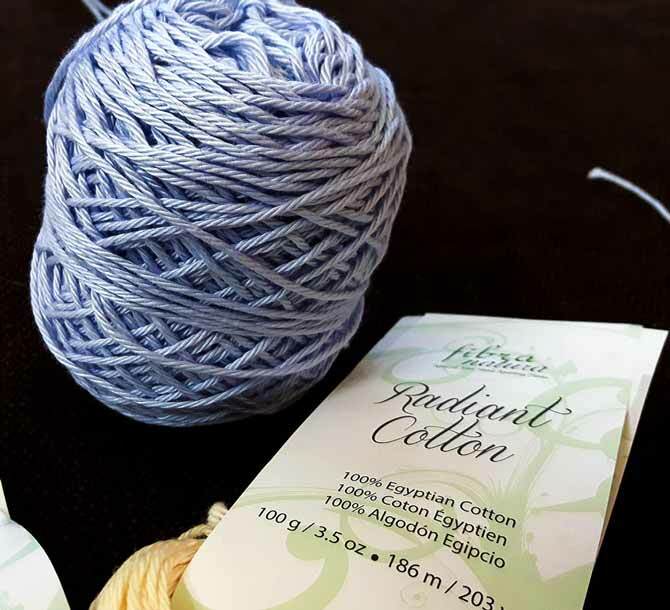 Radiant cotton isn’t a springy yarn and like so many cotton hand-knitting yarns, it doesn’t have much, if any, elasticity, but as it passes through your hands and fingers, it doesn’t feel like a cord or like kitchen string. It is already soft and subtle to the touch. The stockinette swatch (which I’ll show you tomorrow) has a lovely drape and proved to me that it would be very suitable to knit baby’s garments, too. Radiant cotton comes in 24 colors, from the soft pastels that I get to use this week, to some intense brights that would be fun to include in any spring or summer wardrobe. You can see the colors at the bottom of this page. 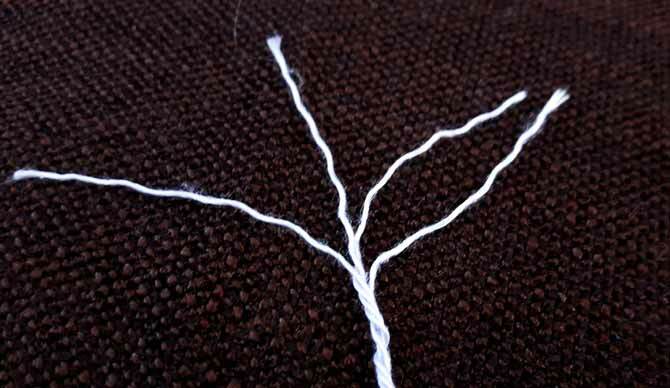 Tomorrow we’ll look at a few pattern ideas and explore a few more characteristics of Radiant Cotton. This yarn has a beautiful twist and definition which is really clear when wound into a yarn cake.